“When I heard about the Fearless Frontline Leader Awards program I was really excited to join Definity and the other sponsors to help promote such a worthy cause. Living in Cincinnati most of my life, I know that manufacturing supports the economic development of Cincinnati and the surrounding communities. Anything that I can do to help thank those that work so hard every day to ensure economic prosperity whether they are from Cincinnati or not, I am happy to acknowledge and join in on celebrating their successes,” states Brennaman. The Fearless Frontline Leader Awards celebrate the day-in-day out contributions of the frontline leaders who fuel the manufacturing industry. Nominations are reviewed by a panel of judges and nominees and recipients are recognized at an annual awards celebration and dinner. The dinner is a ticketed event open to the public and this year’s festivities at Great American Ball Park included a cocktail hour on the field and in the dugout, ball park tours and the chance for attendees to take a swing in the Reds batting cages. Brennaman has been the voice of the Cincinnati Reds since 1974, taking over for, of all people, Al Michaels. He’s a legacy broadcaster, like the Bucks and the Carays; his son Thom is a FOX broadcaster, works with him in Cincinnati and was once a Cubs broadcaster. Oh, yes, the Cubs: It appears Marty is no fan of Cubs fans. Highlights of Marty Brennaman’s career include calling Hank Aaron’s record-tying 714th career home run in 1974, Pete Rose’s 4,192nd career hit in 1985, Tom Browning’s perfect game in 1988, Ken Griffey, Jr.’s 500th career home run in 2004 and his 600th in 2008, and the Reds’ World Series victories in 1975, 1976, and 1990. 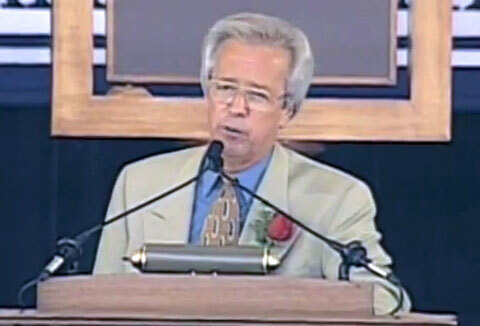 In 2000, Marty won the Ford C. Frick Award, presented annually by the National Baseball HOF to a broadcaster “for major contributions to the game of baseball”. PFP Sports & Celebrity Talent Agency is a booking agent for motivational sports speakers and celebrities. If you would like to book MLB stars or sports casters like Marty Brennaman for a speaking engagement, personal appearance or special event, you can request Marty Brennaman and speaker information from PFP Talent or call 800.966.1380.